A memorial service was held yesterday at the National Memorial Cemetery of the Pacific at Punchbowl as part of the 62nd anniversary reunion of the 442nd Regimental Combat Team. 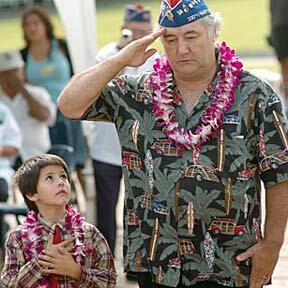 Pierre Moulin and his 6-year-old son, Martin, paid their respects after laying a wreath during the ceremony. Moulin is from Bruyeres, France, a town that was liberated by the 442nd during World War II.